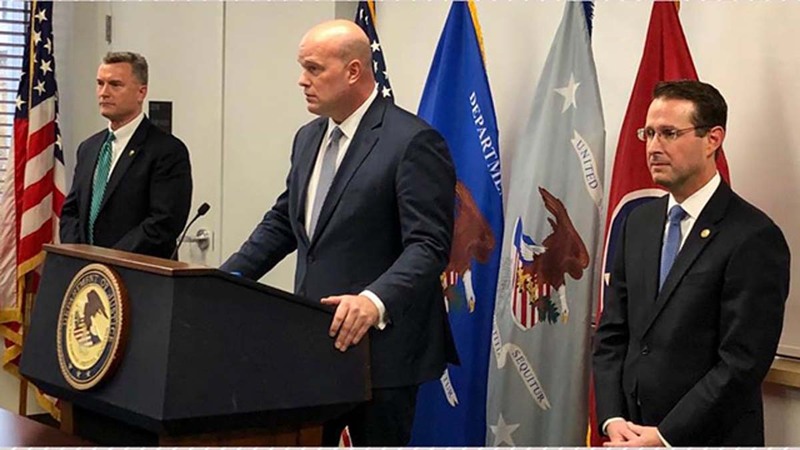 A coalition of local, state and federal law enforcement will soon target Memphis’s “trigger-pullers” and the traffickers who supply them, acting Attorney General Matthew Whitaker said this week. A Crime Gun Strike Force — led by the Bureau of Alcohol, Tobacco, Firearms and Explosives — will expand federal efforts to stifle crime rates across the city, where so far the Department of Justice claims new initiatives decreased gun-related violence 17 percent this year. In 2017, crime rates for murder, robbery and assault in Memphis measured five times the national average, according to the DOJ. Through Project Safe Neighborhoods, law enforcement brought all three categories down double digits. Still, Whitaker said, with carjackings and gun store thefts spiking more than 60 percent, the problem is far from solved. The strike force will include five ATF agents, one senior supervisor and a collection of officers from the Memphis Police Department. Whitaker said the agency will grow its staff count long-term, hoping to expand upon the DOJ’s $1.1 million investment in the city’s Crime Gun Intelligence Center (CGIC) and its connections to the National Integrated Ballistic Information Network (NIBIN). Whitaker said the new technologies, combined with “good old fashioned police work,” help law enforcement identify shooters in real time, disrupt criminal activity and prevent future violence. Dunavant said last month the DOJ’s invigoration of extra staff and supplemental funding helped increase the number of federal firearms cases filed this year in Memphis by 47 percent and the number of defendants charged with gun offenses by over 61 percent. “These efforts provide targeted prosecution of the worst-of-the-worst offenders to enhance public safety in Memphis and West Tennessee by removing guns from the hands of dangerous people and removing violent offenders from our communities,” he said. Project Safe Neighborhoods, first launched in 2001, became the centerpiece of former Attorney General Jeff Sessions’s strategy for reducing violent crime across the nation — a goal President Donald Trump set for him soon after taking office last year. The department awarded $98 million in grants to understaffed local law enforcement agencies and “seed money” to support investigations targeting gangs and traffickers. Some 20 U.S. Attorneys Offices also received 40 additional prosecutors tasked with reducing violent crimes in their respective district. The DOJ estimates murder rates in 29 of the county’s largest cities will decrease more than 7 percent this year. Federal data suggests 2018 could be the DOJ’s busiest year ever in more than a decade for weapons prosecutions. Should authorities keep up at the current pace, total annual prosecutions will exceed more than 10,000 this year — a 22.5 percent increase over 2017 and up by nearly half over the last five years, according to the Transactional Records Clearing House.